Recently, I’ve been noticing that a lot of instructors are under the impression that they are successfully integrating technology, when in fact they are simply using technology. Although this might seem to some as just semantics, in my opinion there is a huge difference between the two – a difference that can be seen in the impact the technology usage has on student learning. 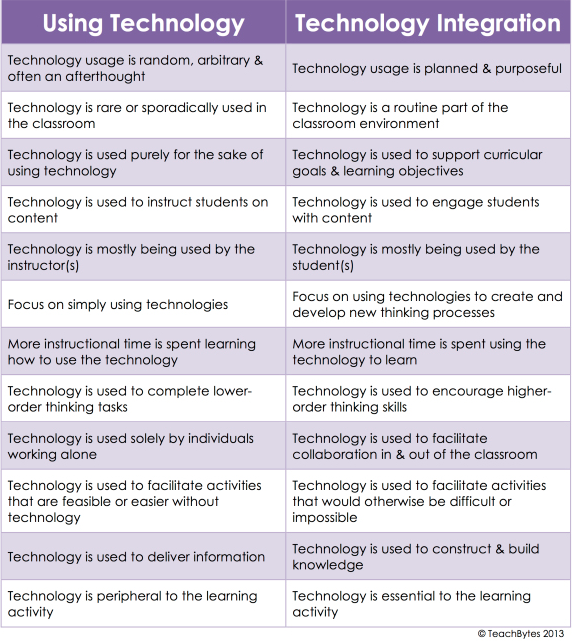 In an effort to better delineate between “using technology” and “technology integration,” I created the chart below to that highlights what I believe are the key differences. Let me know what you think!